It Ain't Easy Being Joe! It is official! 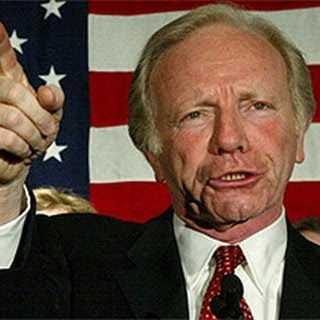 Dopey Joe Lieberman is no longer just the token pariah of the U.S. Senate, he is now also the honorable recipient of the people's choice award for douchiest senator. Ever. Yes, ladies and gentleman, it's true! The charmingly cranky senator from Connecticut now boasts the “highest disapproval rating" in any Quinnipiac University poll in any state for a sitting U.S. senator — except for New Jersey’s Robert Torricelli, just before he resigned in 2002. In fact, well over half those surveyed say they would prefer almost anyone to old Joe, including that crazy mop-top dude with the weird name from Illinois who tried to sell that "f**kin' golden thing" known as Obama's senate seat. Because at least he's honest when he screws you over. So congratulations to you Senator Lieberman for a job well done. You don't even need to be arrested on corruption charges to be considered the greatest mistake the public ever made! Joe Lieberman is the reason why Gore failed miserably. And we all know had McCain not picked the beautiful, yet incompetent, Sarah Palin for running mate we all would be looking forward to a much better world! Hopefully all I know is that Republican values will overcome any "Democrat dreams". It's good to talk a good "game" but make me a believer! It's like saying Santa's gonna show up in a week. But until I see it and know that it is fact, I know that it's just BS as this supposed elected leader has promised. I will never acknowledge him or his "title" until he does HALF of the things he has promised. I can tell you I will make you rich or not tax you whatsoever or tell you the economy will improve over night but all of those things would be lies. And I for one am not someone to lie. I believe in the forefathers' plan to make this a United nation under one, and until I see a competent "President" other than this ridicule with fabrications/promises that will NEVER happen I will never acknowledge that person as the leader of this country. Personally, if I could move to another country and make a go of it until then I totally would. I am not too optimistic about anything, especially after all this Illinois Governor scandal. I, personally, believe that this is just the TIP of the iceberg. This is not the end, but just the beginnng. No wonder why I hate politics! Does anyone know what Mr. Lieberman believes in except himself and his ambitions? He takes the political flip flop to new and daring heights. No safety wire for this artiste! Go Joe and keep flying right out of the Big Top. It's a bird, it's a plane, it's liber man. "Republican values will overcome any "Democrat dreams"
Would those be the values of instruction the White House staff to ignore a legal Senate Subpoena? The *values* of torture? Spying on American citizens without the benefit of a court order? Rendering people, without the benefit of a trial or even of charges being made, to foreign countries which torture? Lieing to the American people? Outing under cover CIA agents, basically an act of treason??? Pardoning those in your staff convicted by a lawful court? Corrupting the Justice Department, converting it to a branch of the G.O.P.??? Are THESE the Republican values you are speaking of? So who keeps electing him?